Ahem, apologies for the terrible pun. 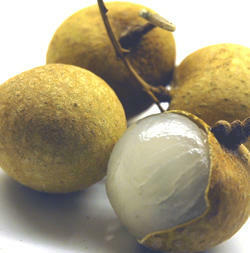 Longans are the less famous, less juicy and muskier tasting cousins of that ubiquitous end of a Chinese meal, the lychee. The Chinese seem to prefer them to lychees and I have to say after munching my way through about half a pound of them this afternoon, I'm coming round to that way of thinking (as Monty Python said "..There' s a hundred million of them in the world today, so I suggest you like them too, that's what I say"). The Mauritian guy in the grocers told me to soak them in white rum for three months with a wink. I figured he was referring to their supposed enhancement of women's libido or their magical properties regarding the cessation of hair loss. That he thought I was the kind of bloke that would have required either of these admirable qualities was a worry. I'll be soaking a batch just in case. On the whole they are an ugly looking fruit, which isn't helped by the fact that they and their spikier cousins are classified as "soapfruit". Though, the name dragoneyes , which I have seen them sold as, does add a certain mystical panache to them. I like them with vanilla ice-cream with a splash of black rum and cinnamon, I'm told they are good with poultry but I am always a touch wary of fruit and meat combinations outside of the pork/apple, melon or fig with cured meat, lemon/chicken/lamb and duck/orange standards. It reminds me too much of dinner parties in the early nineties. Have to get down to Chinatown and get my hands on these little guys. I love the way you write about food. It makes anything seem fantastic. I yet have to try Longans - they were on my list of to-do's and for some reason fell off. Thanks for reminding me, although your review (hope I'm not misinterpreting it) isn't too enthusiastic? By the way, great photography! Love how the shell is cracked open! Thanks guys, and no I love em oliver!